Most of us take our car stereos for granted. Oh sure, we may pay attention when we’re buying the car, or when we head to the car stereo store for an upgrade (or try to figure out how to add Bluetooth to the car); the rest of the time, we just crank it up and don’t think about it much. But when Pioneer invited us to pay a visit to the Pioneer speaker factory and research center in Tendo, Japan, they didn’t have to ask twice. The chance to peek behind the curtain of this car stereo and home theater giant was enough to get us on the flight — and it turns out that a lot of genius and hard work goes into making your ride rock. 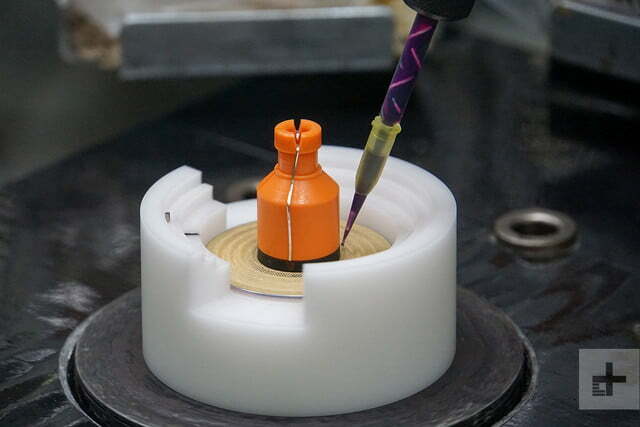 Here’s a key fact: High-end speakers are still made by hand. It’s delicate work and everything has to be aligned just right for the speaker to work properly. 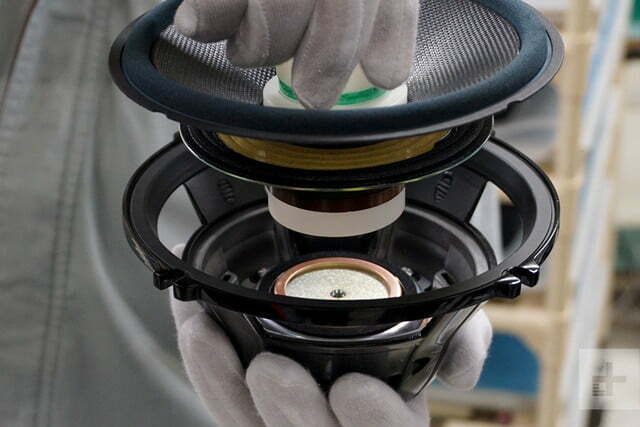 As part of our education in the process, we assembled a basic three-way speaker from its component parts. Now obviously, we’re not professional speaker builders, but it took about two hours to put together a single 6-inch unit from parts. And let’s just say that our results were amateur, at best. 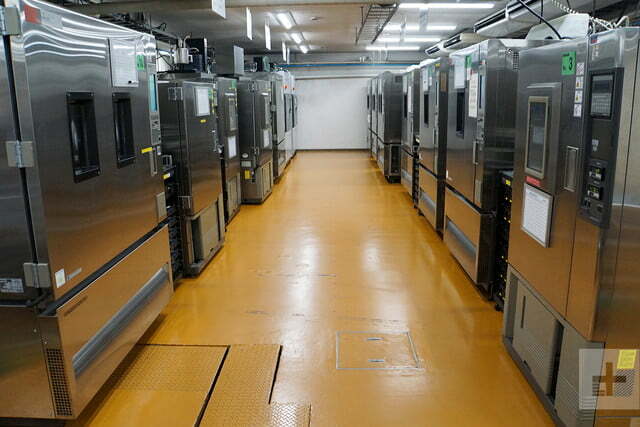 The people working in the Tohoku Pioneer factory are more than lever-pullers and button-pushers. They’re artisans, and they take a keen pride in their work. In Japan, they call that monozukuri – a special kind of craftsmanship. Pioneer has been making speakers since 1938, when Nozomu Matsumoto founded the company. He had become interested in speakers and developed his own design in his radio repair shop. The company grew over the decades, and the Tohoku Pioneer factory was established in 1966. They’ve been at this a while, and they know what works. 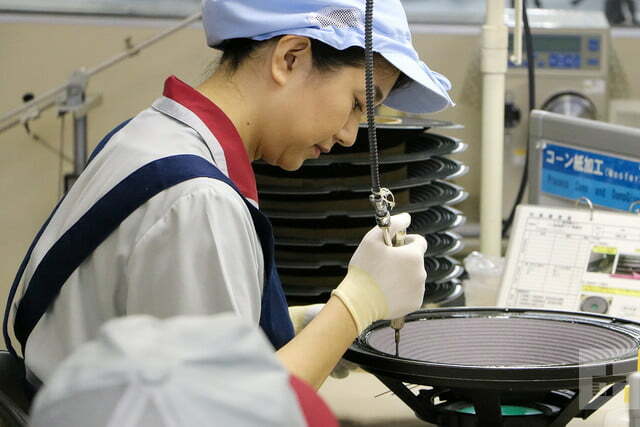 High-end speakers are still made by hand. In Japan, they call that monozukuri – a special kind of craftsmanship. The second thing we learned, to no great surprise, is that materials matter. 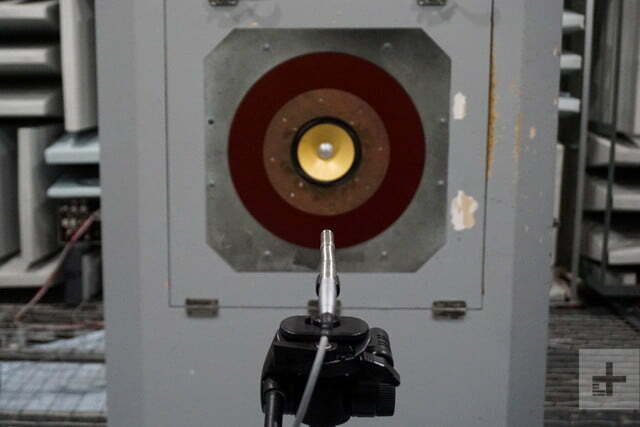 Different cone materials deliver different sound characteristics. Most cheap speakers use a paper cone. Over a surprisingly short time, paper deteriorates, and so does speaker performance. If you get the basic stereo package with your car, this is likely what you’re getting. Better speakers will use polypropylene plastic coated with a thin layer of aluminum, and this material is popular for its clarity in woofers. Aramid fibers such as Kevlar are also popular for their sound reproduction capability and their longevity. 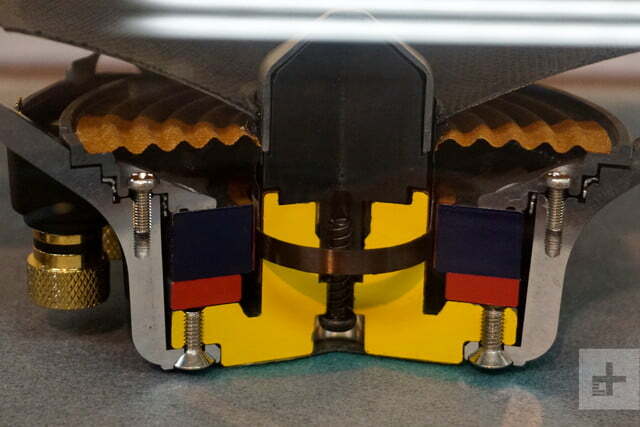 As you might expect, carbon fiber has also been used to great effect, among many other materials. Just as important as the cones are the magnets used in your speakers. The way a speaker works is that the wire windings attached to the cone function as an electromagnet. The sound signal comes through as electric impulses and the electromagnet is charged according to the frequency and strength of the signal. The electromagnet is attracted to or repelled by the fixed magnet at the back of the speaker, and that moves the cone and makes sound. Easy, right? Well, only if the magnets keep working. Think about how long some of your speakers have been in use, and how many hours of playing they’ve done. It’s frankly amazing that these things work at all. 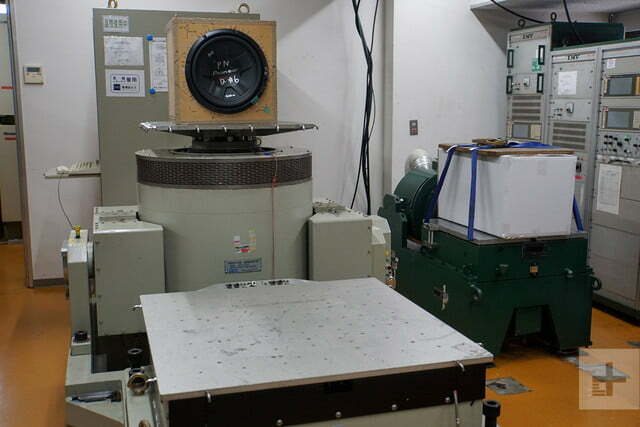 That’s why Tohoku Pioneer engineers spend their careers trying to come up with better magnets, better cone materials, and better designs to fit lighter speakers into the available space in your car. And that’s the next piece of the puzzle. 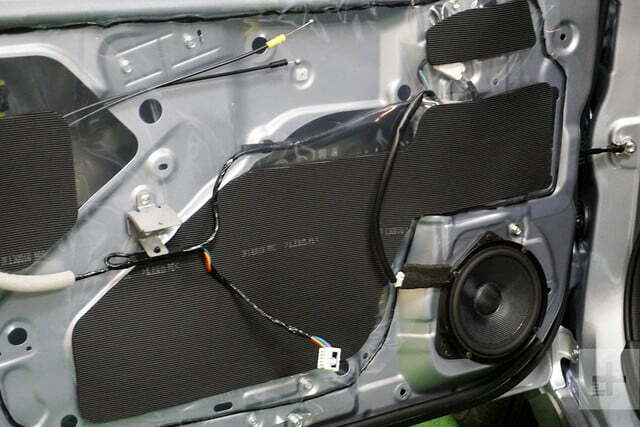 Speaker designers have to work with the spaces given to them, usually in the worst possible places like the car doors and the dashboard, or worse, in the trunk. Their job involves constant experimentation, testing, and redesign to bring you the next generation of speakers. But even when you’ve got good materials, good design, and good engineering, the speakers still have to survive in the toughest environment possible. Think about it – your car goes bouncing down the road every day, and it bakes up to 180 degrees in the summer sun, and potentially freezes every winter. Your car is alternately humid or dry depending on the weather, too. And in that environment, you’ve got this very precise, very sensitive vibrating electromagnetic speaker that lasts for years. To give you speakers that will work properly for years, every new design is put through a grueling series of tests in which the speaker is shaken, steamed, baked, cooked under UV light, and even sprayed with salt water. 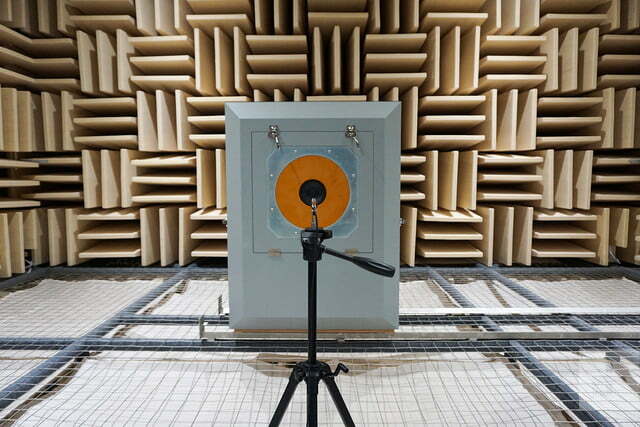 Pioneer’s test lab can put years of playing and abuse on a speaker in a matter of days. 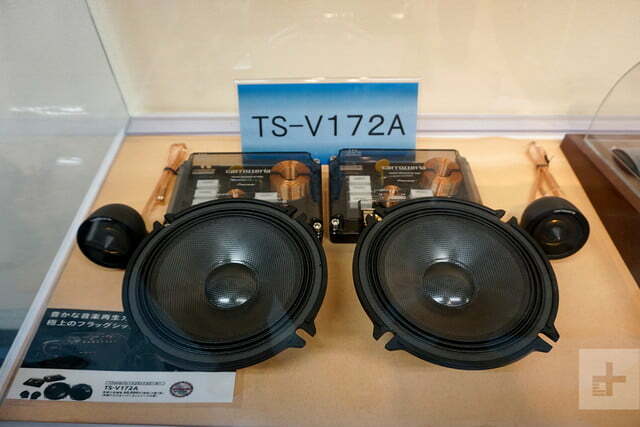 The speakers have to survive all that and then perform to factory spec. If you think about it, the people at Tohoku Pioneer (and every other speaker manufacturer, too) are the real unsung heroes of rock and roll. Without them, your daily drive and your big road trip would be silent. As you might imagine, making speakers is a big business. In the U.S. alone we buy about 16 million cars every year. Each one has at least four and up to 16 factory-installed speakers, maybe even more. That doesn’t even get into the aftermarket industry where most of Pioneer’s products are sold. Think about how long some of your speakers have been in use, and how many hours of playing they’ve done. Pioneer makes its top-end Carrozzeria line of speakers in Tendo at the factory we visited, along with several Pioneer-branded lines. Pioneer has the largest share of both the OEM speaker market and the automotive aftermarket, with speaker factories in Japan, Thailand, China, Vietnam and Mexico. 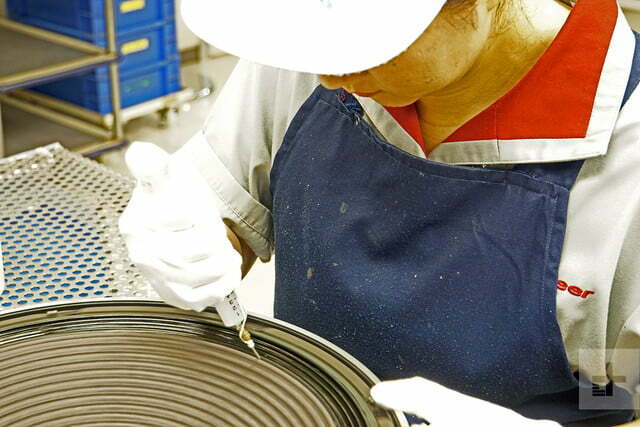 The plant in Leon, Mexico was recently opened to keep pace with U.S. demand. One quick note, if you think OEM car stereos have gotten a little bit worse lately, they have. It’s because of weight. A good speaker uses big, heavy magnets and a big heavy frame. To make the all-important fuel economy and emissions standards while not compromising safety standards, automakers have had to reduce weight anywhere they can, and speakers are an obvious place to do that. Today’s cars have fewer speakers, lighter speakers, and fewer amplifiers to create your sound. It’s a good argument to order your car with the basic infotainment system and then build the system you want in the aftermarket. The great thing about factory tours is that you always see something you weren’t really supposed to see. In this case, we got a good long look at the new D-series and Z-series speakers, which we listened to both in cars and in Pioneer’s amazing listening room. They pinky-swore us to secrecy until the speakers were released to the public, and this is not an in-depth review, so let’s just say you shouldn’t buy any new car stereo speakers until you check these out, because what we saw (and heard) was truly impressive, and surprisingly affordable. I know I’m going to buy a full set for my truck. In the future, Pioneer is working on head-up displays for the aftermarket as well as better and cheaper stereo components and speakers. The state of the art for in-car infotainment is going nowhere but up, and you can already retrofit goodies like backup cameras and 4G/LTE data systems if your car didn’t come with them. But the next time you hear your favorite song and crank it up, give a thought to the heroes back in Tendo who made that possible.